An anomaly... being Pakistani (ie. Lollywood) this two-fer doesn't really belong here, but I quite like it and it was given me by a friend along with a bunch of Hindi albums, so I'm posting it anyway. 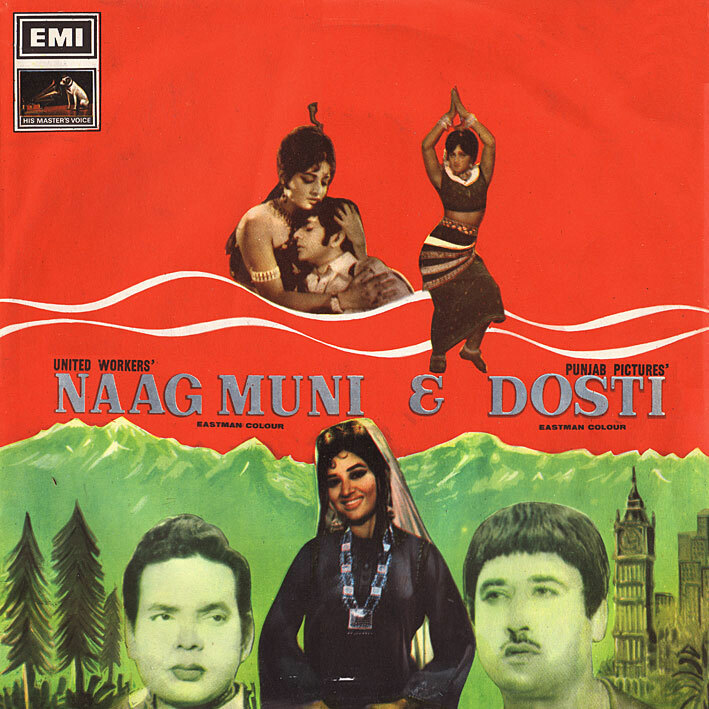 Neither 'Naag Muni' nor 'Dosti' ring bells with me, and I have no idea about the respective music directors... Noor Jehan however, who's on almost every track, is quite famous. In addition to acting, she performed thousands of film songs, making her in effect the Urdu equivelent of the Mangeshkar sisters (Lata and Asha Bhosle). A lovely voice she has too. What this is is a nice collection of mostly traditional stuff, not entirely dissimilar to what we're used to from Bollywood, but different enough (I think so anyway) to warrant attention. The 'Naag Muni' tracks are probably the best; hard to pick out particular favourites though, so listen to it all. What a great addition to the blog! Nice to hear some Pakistani music and of course Noor Jehan. So these two movies were quite popular in their time - and the music director (Nisar Bazmi) was also a very popular and famous Pakistani music director. He was not as experimental as Khurshid Anwar - but nevertheless he was very good! There are more tracks in the film then there are on the LP. Having said that finding the orignal recordings of Pakistani songs is quite difficult as a lot of older recordings were re-processed and echos, drum machines etc were added (Yuck)! Thanks for this though - it's great! Not planned as such. But there will be further samplers though, some more regular posts down the line. Any chance i still can get this. Keep laying the beautiful music treats on us.much appreciated. Hi - how do I actually access these sounds?